I’m sure you probably haven’t heard about the company Bit Cauldron, I sure haven’t up until recently. It is a relatively new company that is just starting to be mentioned regarding the exponentially increasing interest around Stereoscopic 3D everything. Bit Cauldron was formed in November 2008 to focus purely on enabling a world-class 3D experience at home by addressing multiple critical gaps in the 3D ecosystem. The three founders of the company are quite interesting with Sam Caldwell, VP of Engineering at Bit Cauldron that is also founder of a ZigBee RF/ID company, with ZigBee being the wireless radio communication technology that is being used by Bit Cauldron’s products. Bit Cauldron has an advisory board, also made up of quite interesting people, including guys like Geoff Phillips, ATI Vice President and General Manager of the Digital Television Business Unit. 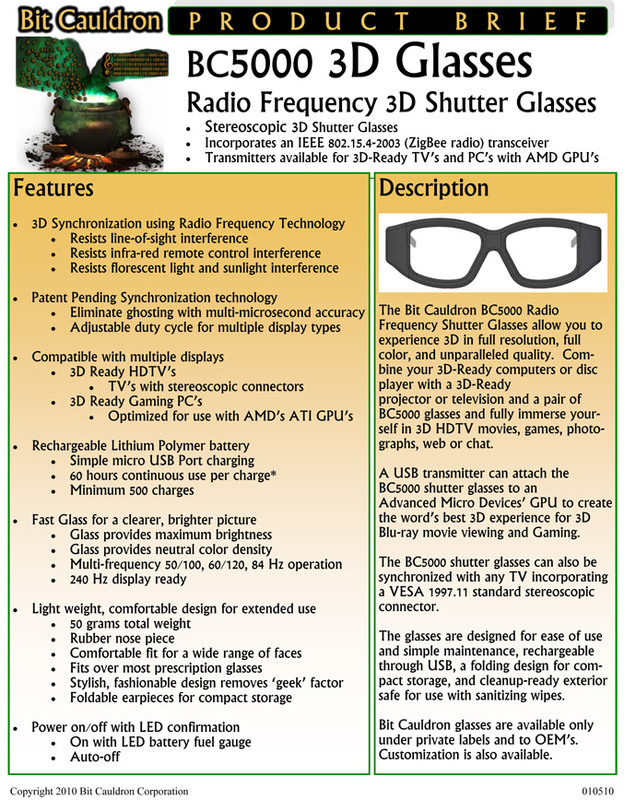 I’m mentioning ATI as it seems that Bit Cauldron and their first product in the form of active shutter glasses for stereoscopic 3D support will be used by ATI for providing a complete Sterescopic 3D solution to be used with ATI cards. This will however require you to have a high refresh rate display – one of the new 120Hz LCDs for instance, along with additional software that will be able to provide the stereoscopic 3D content to the display such as iZ3D’s driver. Currently there are two types of shutter glasses being listed on the company’s website and these are: BC3000 DLP Link 3D Glasses and BC5000 Radio Frequency 3D Glasses. The first one – BC3000 is designed to be used with 3D HDTVs or 3D-ready projectors that utilize DLP Link technology with the glasses having a built in DLP Link receiver. 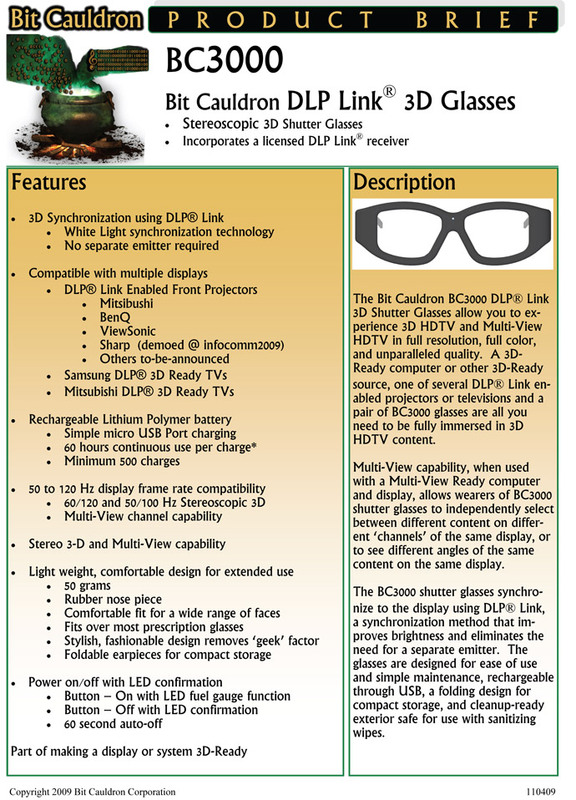 The second product – BC5000 is designed to be used with 3D-Ready computer displays, these glasses incorporate an IEEE 802.15.4-2003 (ZigBee radio) transceiver for communicating with the computer (using USB connector) or again with a 3D HDTV incorporating a VESA 1997.11 standard stereoscopic connector. One thing to note regarding the BC5000 glasses is that they seem to be designed for usage with ATI GPUs as the official website mentions on the product page that there are: Transmitters available for 3D-Ready TVs and PCs with AMD GPUs. So this might as well be what ATI has been referring to Stereoscopic 3D support available for their current line of Radeon HD 5xxx series GPUs. A USB transmitter can attach the BC5000 shutter glasses to an Advanced Micro Devices’ GPU to create the word’s best 3D experience for 3D Blu-ray movie viewing and Gaming. The BC5000 3D Glasses achieve their 3D Synchronization using Radio Frequency Technology (the ZigBee radio) which is claimed to offer: no line-of-sight interferences, no infra-red remote control interference, no florescent light and sunlight interference – things that might sometimes create problems to solutions that use IR (infrared) transmitter for synchronization like 3D Vision for example. Bit Cauldron’s synchronization technology is also claimed to eliminate ghosting with multi-microsecond accuracy, offer adjustable duty cycle for multiple display types and provide glass lenses that have clearer and brighter picture. The lenses of the glasses should offer multi-frequency 50/100Hz, 60/120Hz, 84 Hz operation and be even 240 Hz display ready, which is something that still needs to be verified when the true high Hz TV sets hit the market later this year (3D Vision glasses should also be compatible with these). The battery inside the BC5000 3D Glasses is a rechargeable Lithium Polymer one that can be recharged over a micro USB connector up to 500 times with each full charge providing at up to 60 hours of use. That kit is not available. As webmaster it is my fault that link made it up there in the first place. It’s gone now. I apologize for the confusion. – Dual AMD Graphics: Possibility to combine the performance of the RS880 IGP with future GPU entry level and Cedar Park. – Stereoscopic 3D: Update D3D driver to enable third parties such as iZ3D to use their 3D solution with 120 Hz screens Support glasses Bit Cauldron. while competition n this field is welcome, as it may help drive prices down or push manufacturer’s to add better features, these glasses seem designed for cave tolls. A little more attention to style could have been used…. Give us some stylish or atleast decent looking glasses, with good specs for a fair price and we got all we need. I really hope nVidia doesn’t hold our support for these glasses. I’ve now lost interest in the green/ir based nVidia glasses, and would even go so far as to switch to ATI after this announcement (having recently discovered the benefits of 3D gaming with anaglyph glasses – iZ3D does better than nVidia in many cases btw). I’d be stoked about a pair of nVidia 3D Vision glasses that use this technology (clearer lenses, better strobing, and hopefully a more reasonable price). I could care less how my 3-D glasses look. I want clear lenses and bluetooth emitter. Clearly a homerun for Bit Cauldron right now… All thou I give hudge cred for a company that actully can deliver a product on time. Im buying Nvidia tech now and putting it on ebay the second Cauldron has something in store and looks as good as it sounds. The ZigBee radios that Bit Cauldron is using are a bit different than WiFi/Bluetooth radios, although they share some similarities. I suppose that ZigBee is cheaper and more responsive that what you can do over Bluetooth and for fast synchronization speed for the glasses you might not be able to afford any additional delays. Has anybody any ideas when this product will be available on the market?